Out near the end of the Shotley Peninsula, Erwarton is a pretty little village in a curious situation. It sits on the outskirts of the larger, functional village of Shotley. 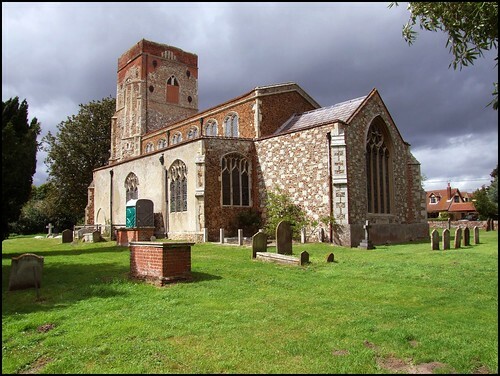 Shotley is one of Suffolk's biggest villages, but its lovely parish church is a mile away, out in the countryside. Erwarton church is actually closer to the centre of Shotley than Shotley parish's own church is. Having said this, there is no suburban feel to Erwarton. We are off the main road here, in one of the strange, leafy valleys which wrinkle the Shotley peninsula. You can never be more than a couple of miles from open water on the peninsula, but you could be set down in Erwarton and think yourself miles from the sea. In fact, the wide river mouth of the Stour lies just a few hundred yards away, and you can stand in the graveyard of St Mary and watch great container ships unloading on Harwich Parkeston Quay on the Essex side of the river. Erwarton is most famous for its Hall; or, more precisely, the gatehouse, a post-Reformation Gothick fantasy that sits directly on the road through the village.I came back here in 2008 after several years since my last visit. It had been raining for most of the morning, but now the sun was shining, and the light on the Peninsula was crisp and clear, turning the underneath of the clouds into a cushion of silver. I'd stopped for a nose at the gatehouse, and then turned the corner to see St Mary's weatherbeaten tower. The 19th century tower top was a repair to lightning damage of 1837, according to Mortlock; otherwise, it's a 15th century affair. The Victorians', too, is the chancel, and generally the whole exterior was patched up. We know from bequest evidence that the medieval dedication of this church was to the Annunciation to the Blessed Virgin, the only known case of this in Suffolk. The feast is on March 25th. The usual Marian dedication around here was to the Assumption of the Blessed Virgin. This feast is on August 15th, at the height of the harvest, and was probably the most common church dedication in Suffolk. There had been a wedding recently, and the gates were crowned by a tiara of bright pink flowers, the petals drifting in the wind from the river. I pushed my bike up to the big north porch, checked that the door was open (it was - they all are at this end of the Peninsula) and went for a walk around the outside. Easily missed is the magnificent west doorway, flanked by crowned lions and with an angel in flight overhead, all 15th Century. I went in through the north door into the square, light space, the wide aisles spreading beneath the arcades beneath their original roofs. I had forgotten quite how breathtakingly beautiful St Mary is inside. The chancel, as if taking its cue from Shotley, has been cleared of all clutter, and the wide central aisle gives a feel of a church that has relaxed gently on the ground. The furnishings date from one of the very earliest Victorian restorations in Suffolk, 1838 by William Ollett, which may explain their pre-Ecclesiological feel. There were simple decorations of pink flowers which offset the interior perfectly; the happy lions around the font caught the mood, and smiled pleasantly. The jewels in all this creamy light are the outstanding windows by Powell & Son in the south aisle, probably the best by the workshop in the whole of Suffolk. They date from immediately after the First World War - one remembers the youngest son of the Hall - and depict St George flanked by St Alban and St Edmund above a crucifixion in a south window, and a fabulous nativity in the east window. The light 1991 window by the Warboys at the west end of the aisle provides an interesting counterpoint, but like many a Suffolk church, St Mary is of essentially three periods; in reverse order, the Victorian restoration, the 15th century rebuilding, and the early medieval church, of which little survives. What does, is worthy of note. These are the monuments. A jolly knight sleeps in the south aisle; he is the grandly named Sir Batholomew D'Avillers, who died in 1287. But the most famous monument here is to the east of this aisle, that to Sir Bartholomew Bacon and his wife, Anne. This dates from the end of the 14th century, although Anne didn't die until 1435, so it may originally have been made for someone else. Far more flamboyant is the extraordinary mural monument to Sir Philip Parker in the north aisle. But the most endearing monument here cannot be seen. Legend has it that Anne Boleyn, second wife of Henry VIII and mother of Elizabeth I, the two main architects of the English Reformation, stayed often at Erwarton Hall. She gave instructions, it is said, that her heart was to be buried in this church after her death. In 1838, when the north aisle was being renovated, a small, heart-shaped casket was discovered, walled into an alcove. It was reburied, with due ceremony, beneath the organ, and a little plaque there gives some details about it. It wasn't until I'd left the church, and was headed on in the direction of Harkstead, that it occured to me to wonder how old the Boleyn legend was. Did the discovery of the heart-shaped casket link up with a tale that went back to the 16th century? Or was it a story invented to link the discovery with the fact that Boleyn had stayed at the Hall? Either way, it's a good one. I cycled on, up a remarkably steep and narrow lane past the busy pub. To my left, the harvest continued against a backdrop of great ships on the wide, silent river, and ahead of me lay the emptiness of the peninsula, the rocket ship spire of the Royal Hospital School a sentinel above the hedgerows.